Pierre-Auguste Renoir, the renowned French painter, spent just over a month on Guernsey. During this time he painted, or at least started, fifteen pictures of Moulin Huet. There is evidence to suggest that some of the paintings were finished after he had returned to France. Renoir wrote of bringing back “documents for making pictures in Paris”, which are likely to have been either sketches or incomplete oil works. Although nobody knows precisely when he arrived, he wrote a letter from his lodging at 4 George Road, St Peter Port on 5 September 1883. In it, he described how he “watched Normandy disappearing” and stopped off in Jersey on the way to Guernsey. He described Guernsey as having “superb rocks, beaches such as Robinson must have had on his island, as well as rump steak and ale at manageable prices”. It would appear he’d had a little time to explore before writing the letter. It’s therefore conceivable that he had arrived just one or two days earlier. 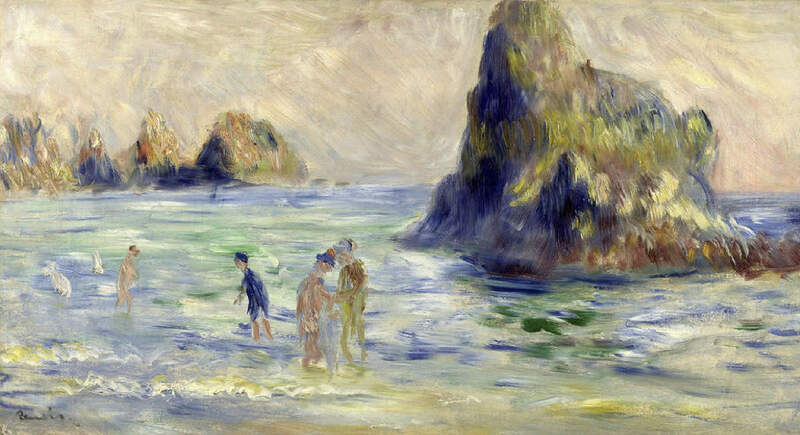 It’s perhaps not surprising that Renoir chose to visit Moulin Huet. The bay was already a popular location for artists of all kinds due to its particular light and the way it played on the rocks. Renoir’s paintings of Guernsey took several years to sell but they have since been recognised as valuable masterpieces. One of them now hangs in the National Gallery in London. In 1988 Guernsey Museum at Candie mounted an exhibition of Renoir’s paintings of the island. The museum itself considers it to be “probably the most successful exhibition ever mounted” there. The exhibition brought together six of the artist’s paintings, and was sponsored by the island’s tourism authorities.